When you pay a visit to the Dlala Nje crew – specifically to see their newest project, room 5101 – you are given a very specific set of instructions. Arrive at the main gate and tell the security guard who you will be visiting. Take the stairs up to P7 and walk through the shopping area until you reach the Dlala Nje shop. 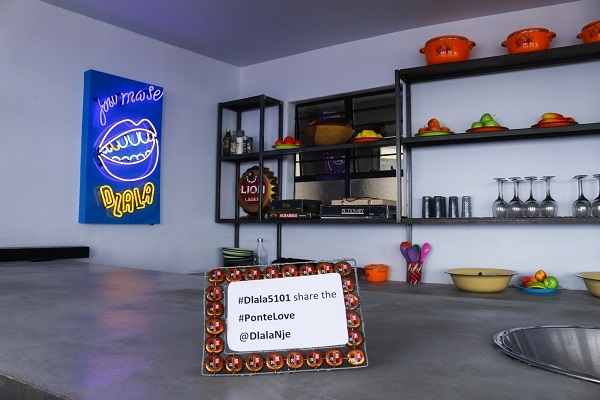 It’s a brilliant way to experience Johannesburg’s iconic Ponte Tower before even meeting up with the good people of Dlala Nje. Ponte can be an overwhelming space, and if you’re driving through the empty parking lot or climbing up the spiral basement stairs by yourself, with nothing but the building’s hollow core echoing back at you, it’s easy to feel like you’re lost, or even trespassing. Having officially launched in December of 2017, 5101 is social enterprise Dlala Nje’s newest and biggest project. The renovated apartment (apartment number 5101 if you were still wondering) is a hybrid space that hosts birthday functions, sundowners, meetings, breakfast runs (a gruelling group jog up the many, many stairs of Ponte) book launches, exhibitions and more. When JHBLive visits 5101, we’re greeted by Dlala Nje’s tours co-ordinator Franck Leya. A resident of Ponte himself, Leya knows the building and its residents well. After signing in and taking the elevator up to the top, Leya welcomes us to the space. 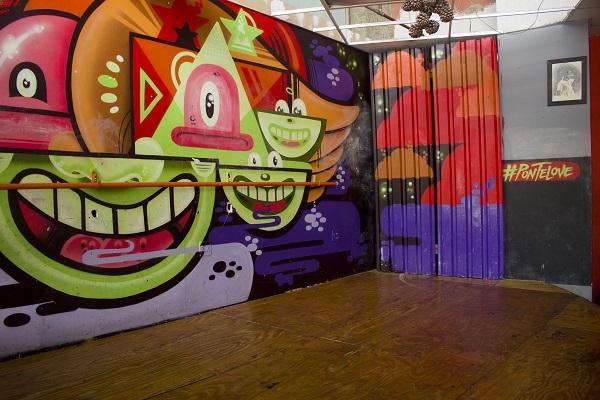 “If you’ve ever been to a South African tavern, you’ll recognise this space,” he says. "We've taken a lot of our inspiration for the space from the taverns." 5101's new open-plan entertainment space. Formerly a two-bedroom apartment rented by Ponte aficionado Nickolaus Bauer, the bedroom walls have now been knocked down to open up the space and the bathroom’s redone to accommodate more people. In the centre of the space are rows of tables – some resting on bricks – all lined with beer crates covered with cushions and material. 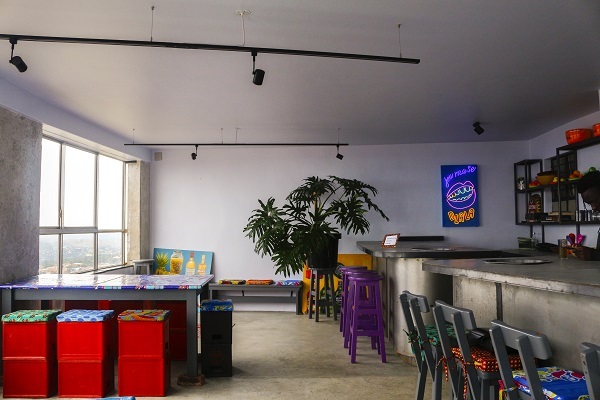 There is an open-plan bar, replete with a well-stocked fridge, and the walls are decorated with works by well-known South African artists, including Ponte’s own Jono Wood. The bar area is fully-stocked and allows for self-service. Upon entering the apartment, a bricked-up stairway speaks to the Ponte days of old, when higher-floor apartments consisted of up to three storeys. The team have also stripped some of the walls, revealing the original colour and concrete of the building from its beginnings in the 70s. Needless to say, one of the main highlights of the space is the exceptional view, with the sun setting in full view from the sweeping windows. So why start something like 5101? Leya explains that as the Dlala Nje team approached their fifth year as a social enterprise, they knew they had to do something big. “For us, it was a case of go big or go home, you know? We’ve always done the tours and used this space as the meeting point, so it was a natural step to make use of this apartment,” he says. The reception to the new project has been resoundingly positive so far. They’ve hosted 40th birthday parties, enjoyed sundowners with the team from AfroPunk, and continue to use the space as home base for their many tours and breakfast runs. With the tour all concluded, Leya says goodbye at the Dlala Nje shop downstairs before giving directions to the building’s core. “You have to see the core. 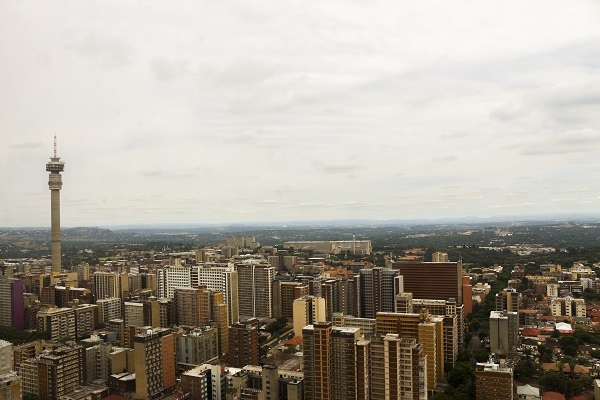 You haven’t been to Ponte unless you’ve taken a photo at the core,” he says laughing. 5101 is available for events ranging from birthday parties and meetings, to book launches and sundowners. Contact niki@dlalanje.org or loops@dlalanje.org for details.